The universe speaks to us all if we choose to listen. I had the most amazing chain of signs this morning and they all felt like they were orchestrated just for me. Walking down the street, running some errands, I see a piece of concrete in the shape of a heart. 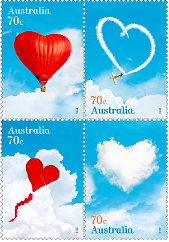 In the post office, the attendant who was helping me with some express post envelopes – completely out of nowhere, for no reason whatsoever, very left field tangent – shows me the latest issue stamps for valentines day (see picture). Then, while I’m writing out my express post envelope, the radio begins to play Steve Winwood’s Higher Love! Hellooo Up There! I love you too… 🙂 What signs are you receiving loud and clear?